I sincerely would like to know where time goes. When you're a child it passes so slowly. You're as a child wanting to be an adult, and once you're finally an adult you long for the care free overlooked childhood you once had. Then when you have your first child, time seems to pass very slow during all those sleepless newborn nights. Then the first year comes, and the second. Before you know it you have two children. When you have two children time passes even more quickly. You wonder where did this time escape to? The moments spent cleaning, the moments spent complaining. the moments spent lecturing. Suddenly you wake up as a parent and realize there needs to be a freeze button. The pause button, no fast forward, no rewinding. You realize that When your first baby is almost done in Kindergarten the last 6 years have gone by and even though you (I) have been a fully devoted mom who never goes out, it's gone so fast for me. You want to enjoy it more. You stop caring about the petty things. You want to live in each moment, do the things you dislike just for the sake of making your children smile. After all, her smile is worth it, isn't it? Today was her last grading period awards ceremony. Today I watched my little girl and it hit me, she's growing up. This year went by so fast. I can fetch every detail and it's crystal clear over the last few years, but it's still moving. It never stands still, and so for that very reason, we as parents need to grab our children and love them and tell them every single day they are the most important people to us. I wonder if my mom looked at me how I look at my daughter. You start motherhood as a young adult, and if you should be blessed to be an old lady in the end, you realize your lifes purpose has been to help another human being become something in life. You want so much for them. She's only in kindergarten. And I love her so much. I love both of my kids to pieces. I hope they know that, because I will remind them every single day for the rest of my life. I often catch myself in a moment of sheer joy wanting to shed a tear and I hold back. I imagine one day when I can no longer hold back my tears of joy and counted blessings and my children ask "mama what are you crying for", that I can say to them "because you make my life worth living". Is kindergarten really almost over? Is the baby who I held in my arms as a 22 year old first time mom really growing every day? She is. And I want so much to protect her from the world and I know one day she will be older and want to do her own things. And so I am glad in moments like these, I realize that she will be my grown child one day and I have to love and seize these moments and make them linger as long as possible. Today I am thankful. I am thankful for being. I am thankful to GOD for trusting me enough to give me two beautiful children. I am so blessed and I know I will never take that for granted. I too often do great reviews. But do believe me, when I get the short end of the stick I will be quick to rant about it. Teleflora is AWFUL. TERRIBLE. HORRIBLE. I ordered not ONE, but TWO bouquets of pricey flowers for my childhood friend and her mother. It was important to me that these flowers were exactly what I ordered for the occasion I was sending them. BIG BEAUTIFUL, LOTS OF BLOOMS PRETTY PINK RIBBON, etc. Sure, it is pretty, but it is NOT what I ordered. NOR what I wanted for my friend. No green flowers to be seen. I ordered the specific bouquet for a reason, and this is what she got. :( I wanted to cry. It is pretty, but it's NOT what I paid for. I also ordered her ailing mother a bouquet and it was similar but NOT what I ordered either. The first time, I could not even understand the customer service representative. I am not trying to knock on companies who hire foreign people, but I could not understand him AT ALL. After 8 minutes of me saying "pardon me sir", "excuse me", etc. I was flaming po'ed. Not to mention there is so much noise in the background at their call center. IMPOSSIBLE. When I finally did get him to understand me, he told me he would sent a replacement the next day. The replacement was never sent. I did a follow up call, and the same thing. The CS at Teleflora was hard to understand, did not comprehend basic English and gave me the run around. I did get meek "I am sorry for that". Well, good for you, I am glad your sorry BUT your apology DOES NOT sit well in my bank account when I spend 100 bucks at this company and got the cheapest bouquets on your list sent to my dear friends. I was never offered a partial reimbursement. I was never offered store credit (and believe you me I WOULD NOT accept store credit if it was offered because they are a sham). My supposed promise of a re delivery never occurred and I am upset. Teleflora is AWFUL. Teleflora is DISORGANIZED. Teleflora is a SCAM. I should have read other reviews before going through Teleflora. I did not. That was my mistake for trusting a company like this to do the right thing. SO NEVER EVER EVER EVER ORDER FROM TELEFLORA, because chances are they will send your loved one something that looks like it came off the shelf of a discount drug store (lol sorry i love you discount drug stores, but you know what I am saying, 14 bucks compared to 100 is a huge difference). TELEFLORA will NOT reimburse you, they will NOT redeliver for you, you will NOT be able to understand their customer service reps. AND the list could go on. From now on I am sticking with the flowers that come on a delivery truck, I believe they are FTD? Not sure. all I know is TELEFLORA IS BAD. VERY BAD. I would not ever go back to TELEFLORA for another thing. It is not acceptable to sent someone something they did not even order. JEERS to your company TELEFLORA, and you should know that companies profit on honesty and good reputation. Your company is DISHONEST, and does not work with the customer. I am out money but I can promise you it's your loss in the long run because you have lost a customer. And I will be sure to let everyone know just how bad you, TELEFLORA truly are. CVS Scenario for Memorial Day Weekend!! 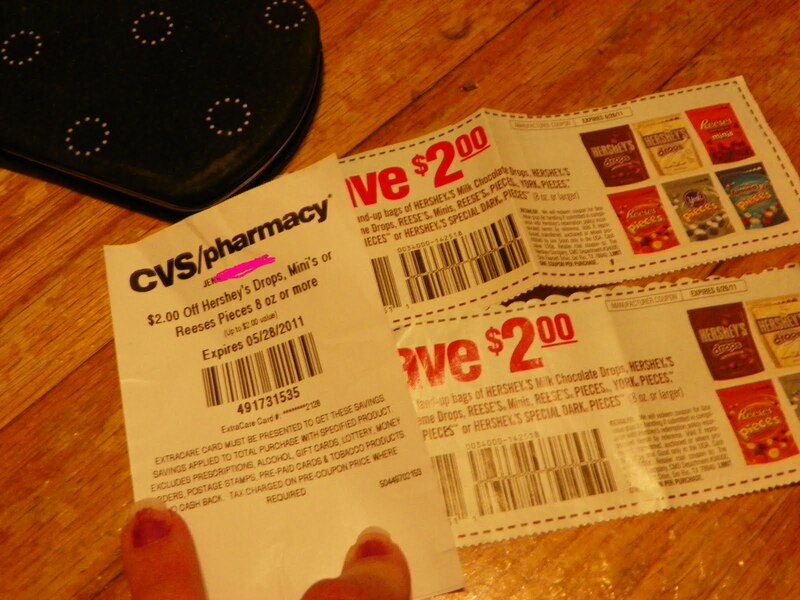 If you recall my previous CVS trip, you will remember I made $9 in extra bucks. When Thursday came, I was eager to check out the up and coming ad for this Sunday to see what items were earning extra bucks that I also had coupons for. use (2) 2$ off 2 from Sunday paper & use (1) $2 off from cvs coupon machine I got a few days ago. One of my local stores does their Sunday deals on Saturday evening, so I took advantage so that I could obtain the items in stock and not have to worry about being up early to beat other shoppers before they wiped the shelves clean. (Happens EVERY time)! 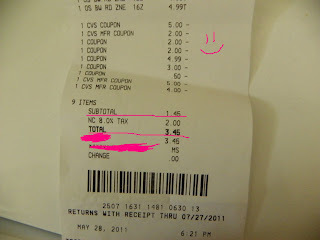 Thankfully, my math was right on the money and I scored everything pictured for $1.45 +$2 sales tax for a grand total of $3.45 out of pocket. 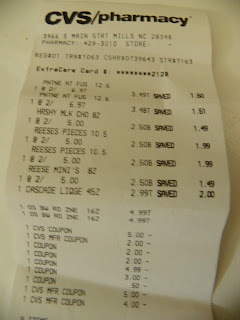 I also made back (1) $2 extra buck on the Pantene deal and (1) $3 extra buck on the candy deal. If you want to look at it another way it is LIKE getting everything FREE + making a $1.55 profit! Other than that, I have been extremely overwhelmed with my children, getting by and doing the side jobs. I am thinking tonight I may finish the last of the painting on this second Craig's list dresser. 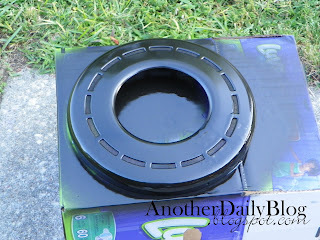 I can't wait to show it off when it is done. Have a blessed Memorial Day weekend, friends!! And MANY thanks to all our soldier's both past and present! I love Gymboree. I think the clothing is adorable! I rarely shop Gymboree, however, because it's just not in my budget. AT ALL ;) Every so often when a sale runs, I will pick something up. It is shocking to me the outlet stores charge FULL price on last years lines. I bought MiMi a dress once from one in Smithfield and I will never do it again. So I received an email from Gymboree stating that they had a $12.99 sale. I figured, it's probably on the tshirts and thought I'd go window shopping via the internet to browse at stuff I could never afford. When I got to MiMi's size section, I was shocked to see the $35 dresses on sale for $12.99. 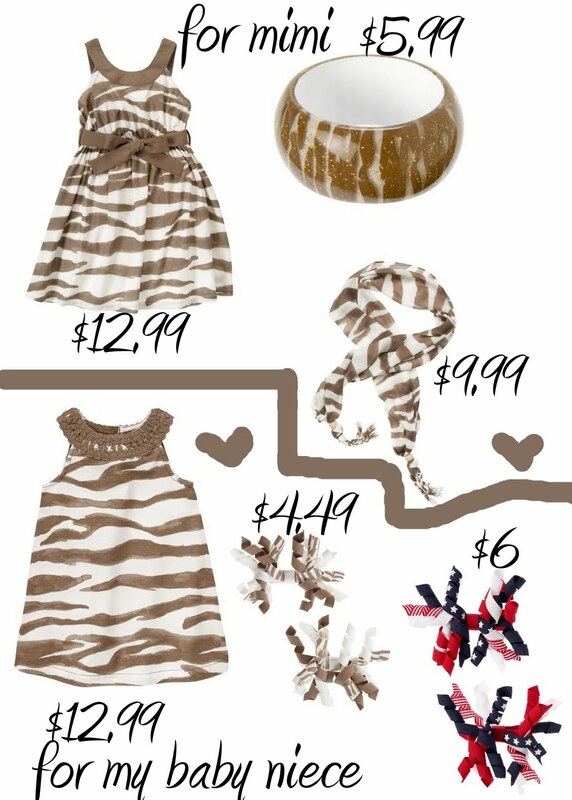 Of course, I see that as a bargain any day I can get a dress that cheap that looks cute. SO I spent $52.95 on what would have been over $100 retail value. I will get $25 in gymbucks back so this makes the outfits cheaper than I could of bought at, per say, Target or the likes.. I bought the scarf for her hair, and I really wanted the chambray romper but they were out of her size :( I'll use it with another denim type outfit I'm sure. It came with 16 packs fine point markers, 16 packs or large markers, 16 dry erase markers, 16 dry erase boards, AND one LARGE dry erase tripod board. The guests are going to love this!! He also went on to color my walls in the kitchen. AND the white cabinets. And the fridge. Oh, and dare I say it, the glass windows. Yep, he had a field day. 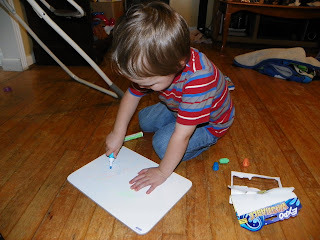 I thought it would be the perfect opportunity to see if expo washable markers lived up to their name. I took a wet paper towel, and it came off instantly. I see myself purchasing these solely in the future for him for this VERY reason. I have a few extra packs for non attendees that I am sending to promised friends via snail mail, and I will also give a set to MiMi's teacher so the kids can use them at school. I let MiMi try out the larger board and she is smitten by it. 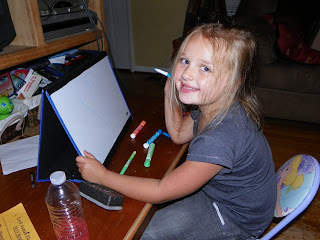 Kids LOVE to color, they LOVE markers. 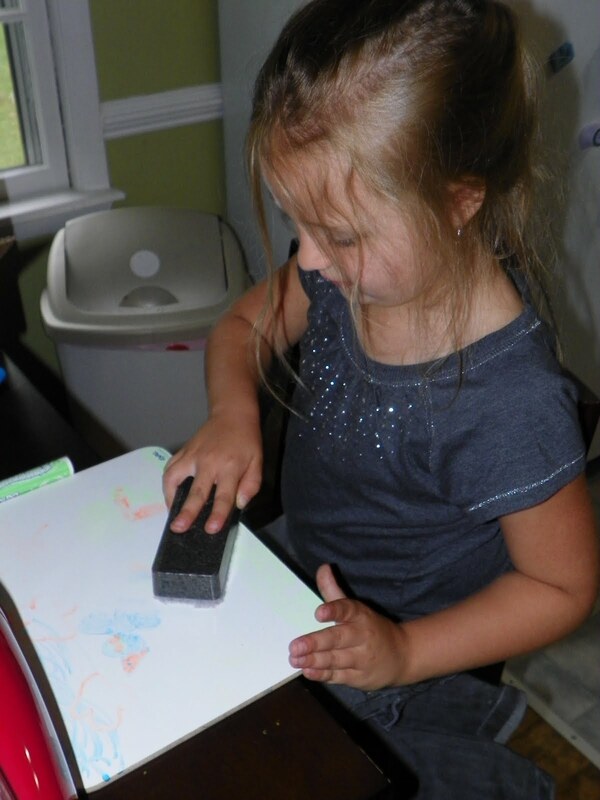 THEY LOVE things they can erase with out fuss and this does that job! These would make a perfect summer "keep em busy" item. 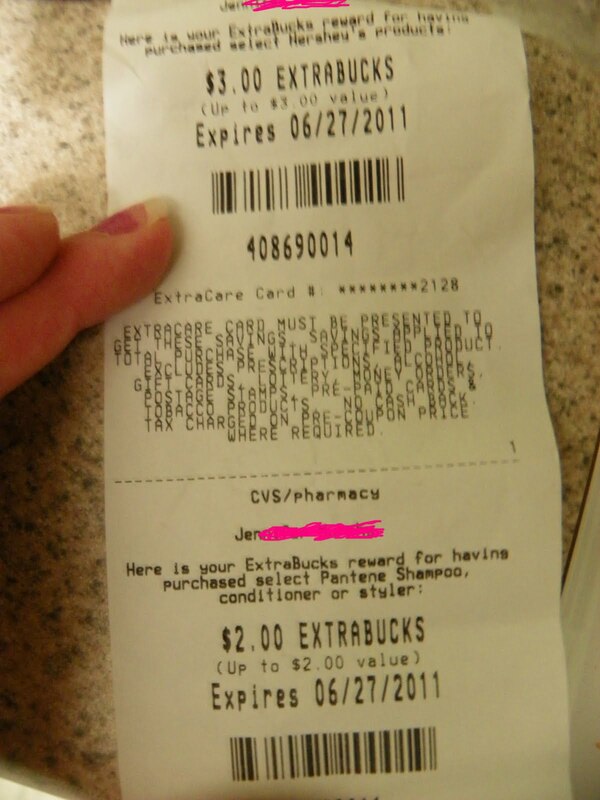 I also received a free product coupon for cottonelle flushable wipes. THANKS COTTONELLE!! 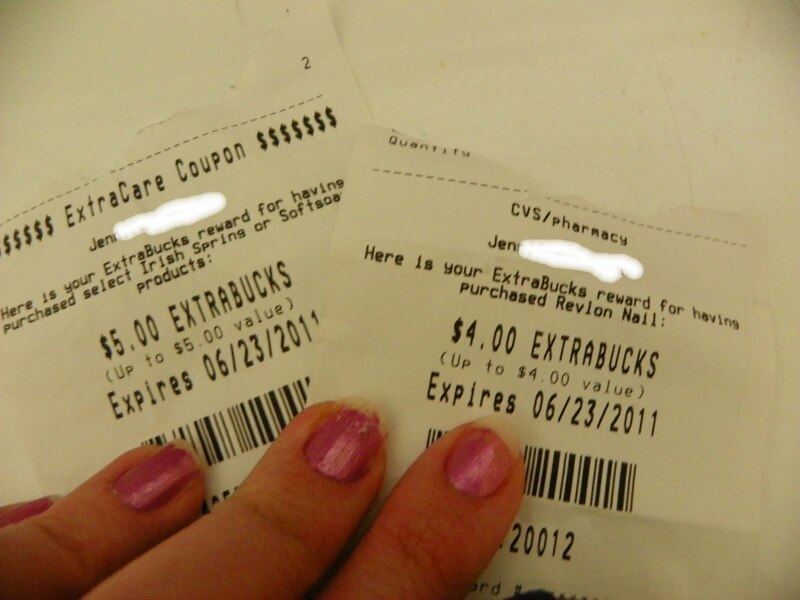 CVS looks like the perfect week to roll the extrabucks! Many of you cvs'ers have probably received the $5 off $25 purchase coupon. 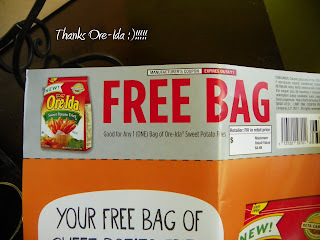 Usually when I get this coupon, I take it as an opportunity to use my buy one get one coupons. 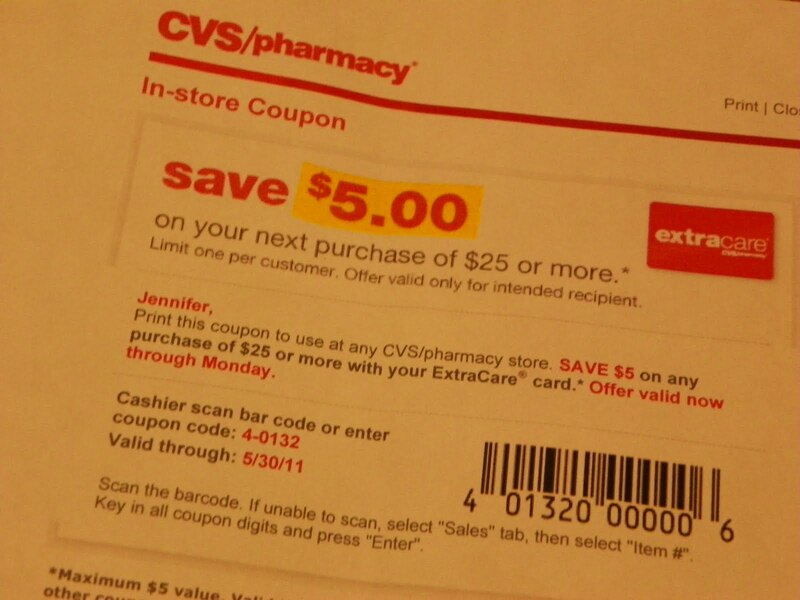 I will post my CVS list for Sunday tomorrow morning, I went over the $25 limit but I will pay only .95 for $29.99 in coupons. 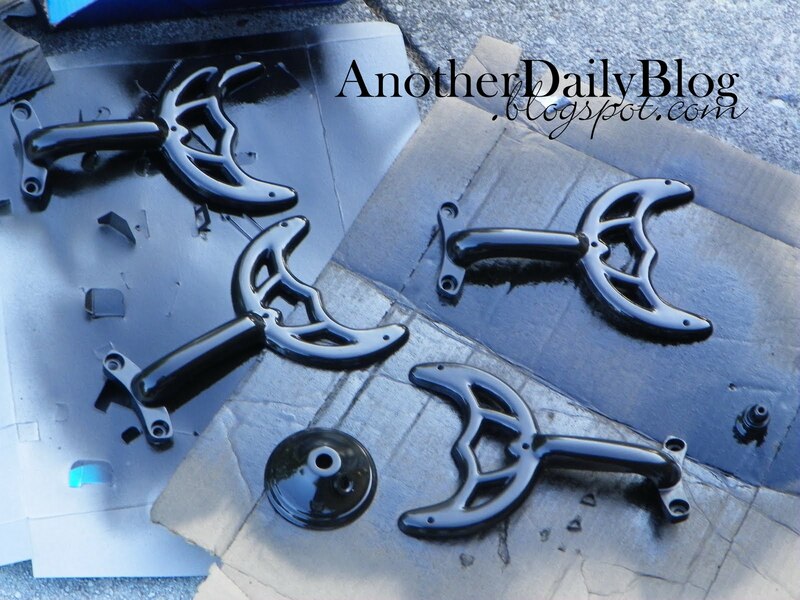 Be sure to check my blog tomorrow to see how :) Good night and enjoy the Memorial Day Weekend. God Bless Our Troops! (both active and retired/former). Free @ CVS + Made 9 bucks! 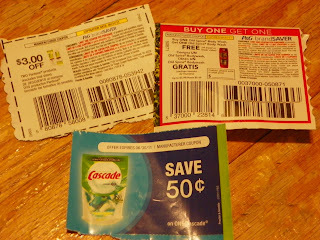 FREE + made back $5 on the 2 softsoaps (deal was buy 2 @ $7 and make $5 extrabucks). So everything above was FREE just for rolling my store credits! Of course I had to splurge and by myself the new revlon colorburst lipgloss in hot pink. I loved it so much from the sample I recieved in the mail that I purchased it at the full $8 :) haha. All this for .83 @ Harris Teeter! 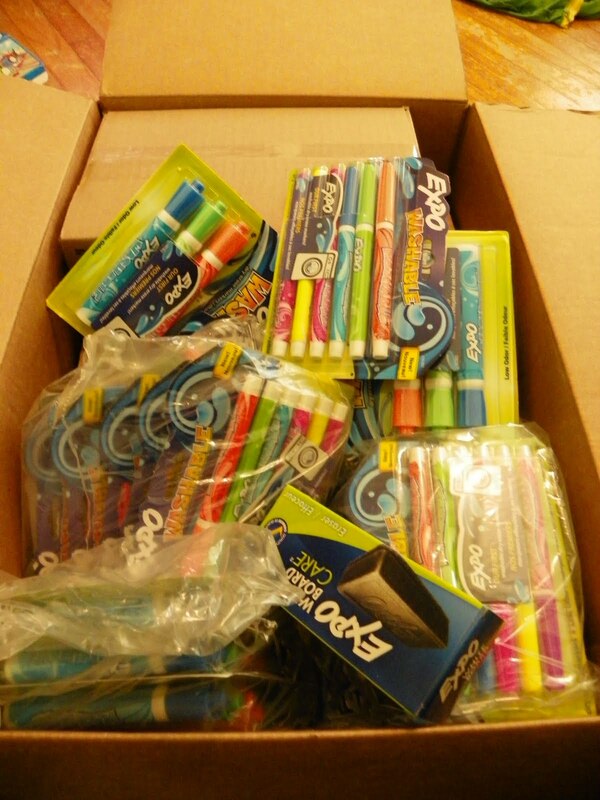 Minus .75 coupon for oral b tooth brush (in p&g home mailer) (won't triple bc there would be overage and HT does not allow overages so it rounded down) - 2 tooth brushes for FREE!! .49 +.34 = .83!! 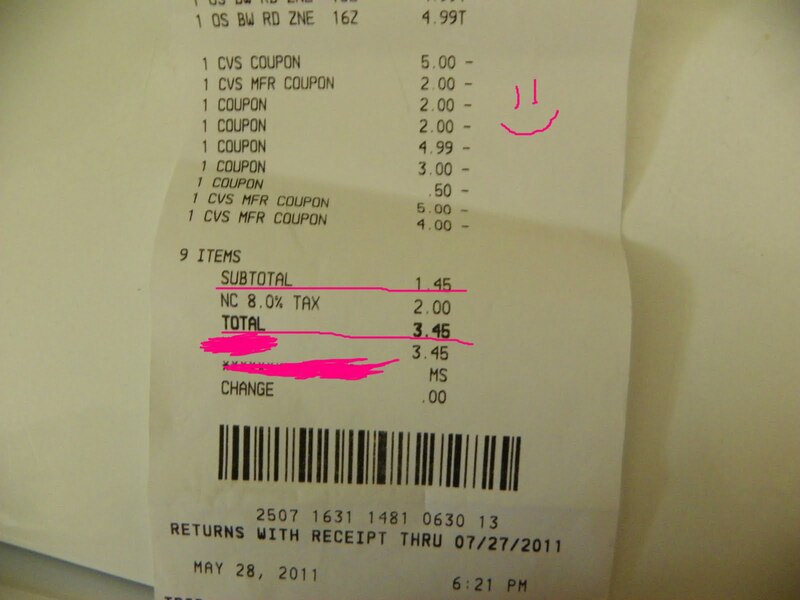 :) Everything else I had coupons for was gone. I have to admit, I have been discouraged stepping into most stores once the sales ads hit. It used to be I'd go in and get my items with my one set of coupons and the shelves would be hearty. Now when I go first thing in the morning I find that the shelves in the only two stores I really coupon at (CVS & Harris Teeter) are bare first thing. I know some people have multiple coupons and stock up. I guess I am just jealous I never even get the chance to use my one coupon ;) But, as they say in the coupon cyber world "the early bird gets the worm". Some how even though I get there very early, I usually miss out. All I have done this week was the purex laundry detergent @ CVS. 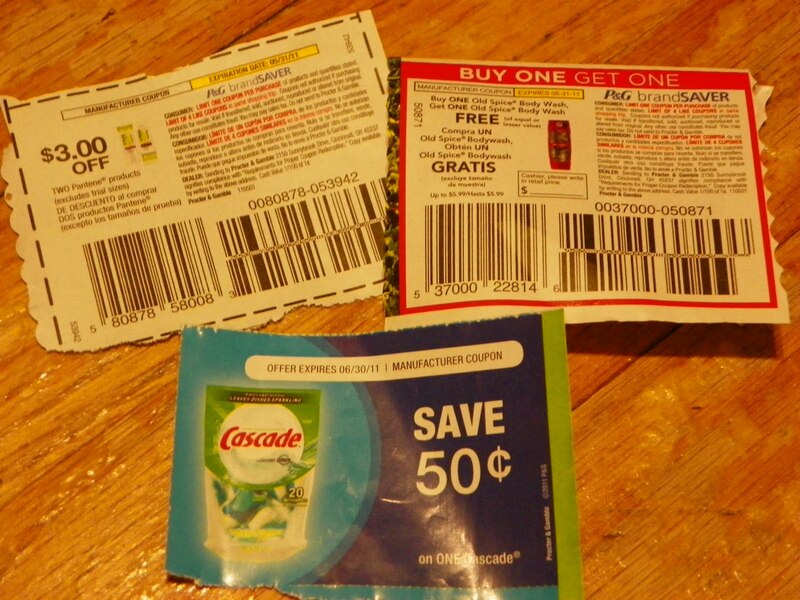 Okay, I should admit it, I am a hypocrit according to my above statement, because I infact used 3 purex coupons. CVS has a sale on the 50 ounce Purex laundry detergent bottles for $1.98. 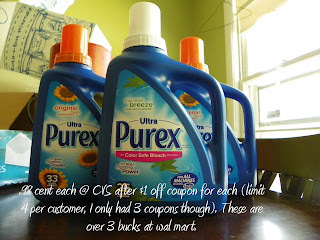 I used a $1 off purex coupon in one of the ad inserts from a couple of weeks ago, making my 3 laundry detergents .98 a piece. 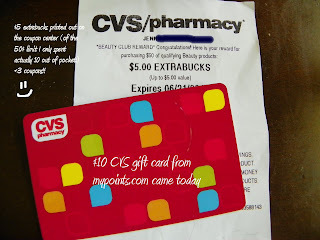 I redeemed my mypoints.com points for a $10 CVS card. Then I also had a $5 beauty club extra buck print out for me on the coupon center. I plan to hit up CVS in the morning and roll that money like you wouldn't believe :) So tomorrow I will show you how I roll this combined total of $15 and get tons of things FREE and make money back! 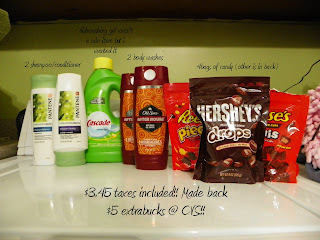 (Hint: includes revlon nail polish, softsoap body wash, one more bottle of purex etc..Have to do it when you have 2 kids and are on a limited income). 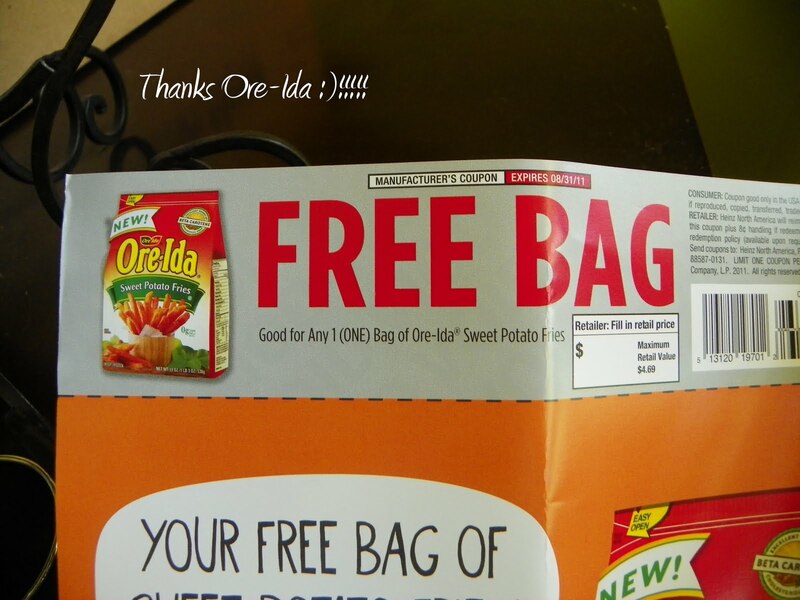 Not only did I get that in the mail, Ore-Ida sent a coupon for a FREE bag of sweet potato fries, via their facebook page. Oh my, lucky day for me! Bamboo is evil :) (or atleast hard to eradicate, if at all possible). If you have read my posts before pertaining to bamboo, you probably know by now it is like a weed. For some ungodly reason it's classified as a grass, but it's the hardest wood I've ever had to cut down. (well, I am lying, mostly Doug cuts it with a machete). I on the other hand? I mow them over as they pop up. They are pretty much impossible to get rid of. No herbicide kills them, no amount of cutting down kills the rhizomes, burning doesn't do a thing, NOTHING HELPS. Of course the bamboo society recommended cutting down all the mother plants (good luck finding that when we have thousands behind our yard etc). So the plan is to cut it all down, and starve the rhizomes. They say you have to be vigilant or it will not go away. I personally find this to be the biggest nightmare as a home owner (yard wise). Bamboo is so hardy it grows through ANYTHING. It has grown through a HUGE oak tree log laying in the back and split it right in half. When we had a big pool up one year it grew right through the liner with thousands of gallons of water pressure a top it. One week I ran over 100 culms of baby bamboo canes. Two days later there were 100 more. 3 days later there were 60. Today Doug chopped down a ton of the large stalks in our yard. We are planning to see if anyone will buy them for a buck a pop off craigslist. (make lemons out of lemonaide right)? I mean I see canes of bamboo bundled in fives for ten bucks at target. Our canes are HUGE in comparison. Either way, I just want it gone. We plan to take down all stalks in our yard, this way as they grow we can just keep mowing them down. Unfortunatley for us, we will never control the rhizomes since the canes are now behind our property and in a neighbors yard. Dear readers, whatever you do, before buying a home, get an inspection, note if there are any bamboo canes cut, and STEER CLEAR! It's a nightmare. We were duped as the previous owners withheld this from us and did not disclose it. My only concern is if it will grow in the crawlspace. Preventative measures say to dig and pour a concrete barrier, and as much work as it is? Well, it's worth it and we may do that to save the house from bamboo. If it can grow through a tree log, a huge pool filled with water, who is to say if god forbid it gets in the crawlspace it won't grow through pipes or subfloor? I pray that isn't the case, but the stuff is pretty insane. 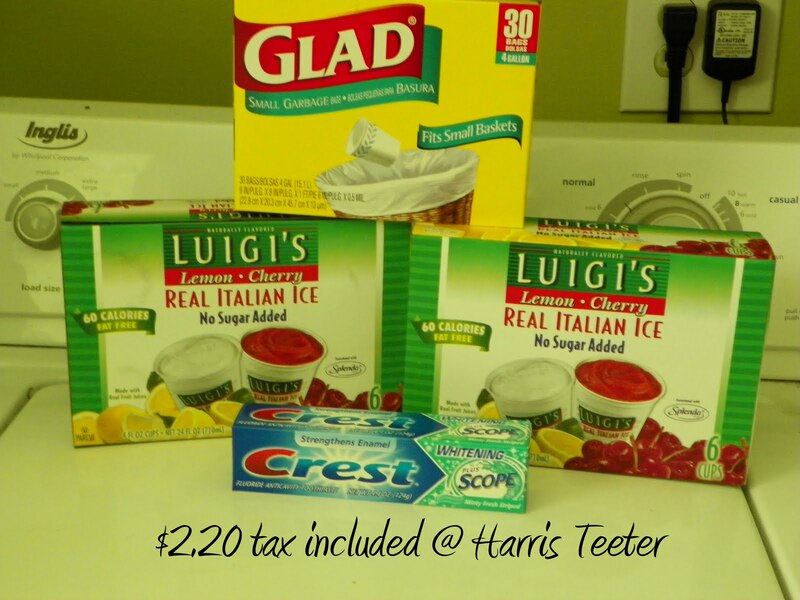 Harris Teeter Triple Coupons Trip! This is crazy! 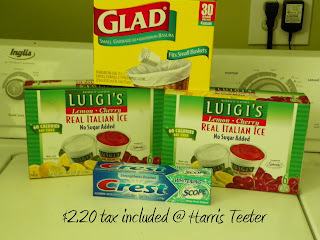 Harris Teeter had triple coupons today (any coupon up to 98 cent tripled at the register). Of course I had my list and planned late last night, banked 3 hours of sleep, got up early, took MiMi to school and headed on over to Harris Teeter. In the past when I did this I would be one of the only few people in the store. Today it was slam packed. Everything that was a sale item was virtually already gone. Of course Ethan was being a screaming banshee and the only 2 year old screaming to his hearts content. I know, you're probably thinking, c'mon lady, he's 2, 2 year old do this sort of thing. Oh, they do, believe me, I know first hand. Ethan screams bloody murder if he can't get the shopping cart's seat belt on. Then he screams bloody murder when he can't unbuckle it. He will sit there the entire shopping trip fussing about the seat belt. If we go to a store with Thomas the train toys, I better steer clear or he will throw a world war 3 temper tantrum like no body's business. Personally I am not humiliated I just kind of don't make eye contact with anyone and if I do pass someone I say something like "it's okay buddy, you're too big for the seat belt". Other times I want to burry myself head first in a pile of dirt/sand/whatever. MiMi on the other hand has always been a simple child. I don't know, boys must be a different ball game obviously. He's still his mama's little sugar though! 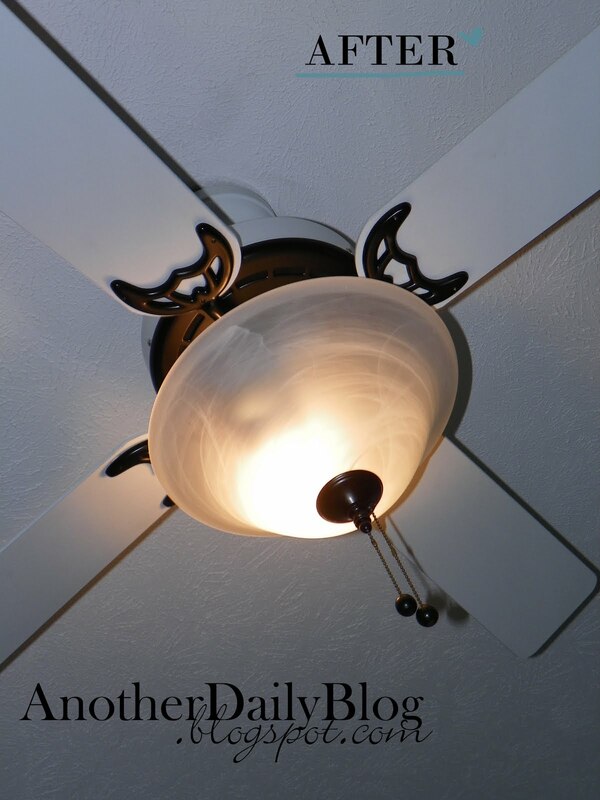 I haven't posted in a bit because blogger was down for a while. But I purchased another craigslist dresser. This thing was a BEAST, but you will probably be amazed once I do the reveal. I am not even going to post befores until it is all done, it's that exciting and that much of a difference. I should also mention the seller was not the best and left me with rodent poo, roach casings and live spiders, (after I specifically asked if this was a storage item because I did not want to encounter this) and he assured me it was not. I also asked if it was solid wood, and again, he assured me it was. My surprise when Doug brought it home with is horrible veneer top (ack). I ended up replacing it witha real wood slab, but like I said, this one is a TOTAL trash to treasure. I think after taxes my total was $2.20. The kids like the Italian Ice, so that was a positive. We are a struggling family so anytime we can get something so cheap, it's a good day in our household. KRYLON Oil Rubbed Bronze Ceiling Fan Make Over!! PRETTY - PRETTY!! I've been staring at this ceiling fan in our bedroom for the last 7 years. It's white, it's plain, it's brass. 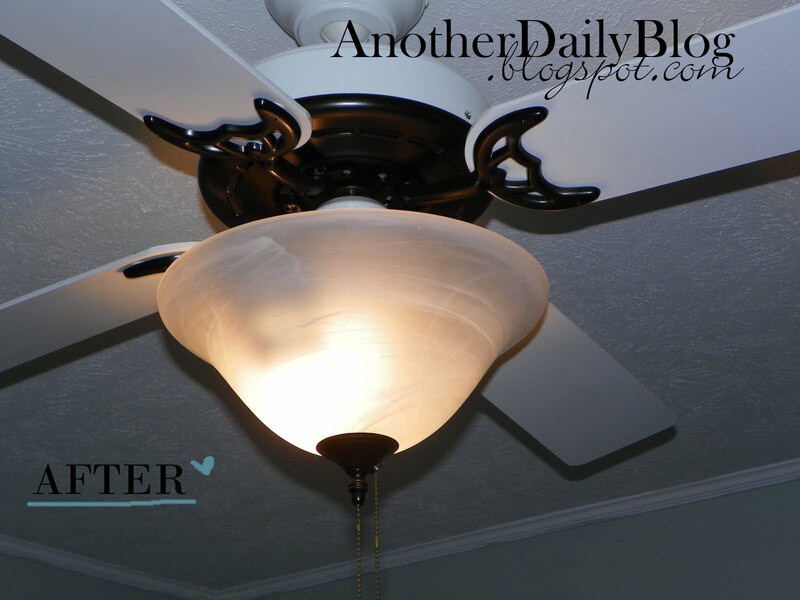 It's not the ugliest fixture our house has had, but it's not too modern either. You should know by now, dear readers, I am too cheap to buy a new one just for aesthetic purposes. 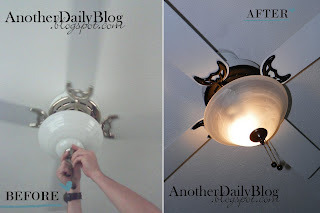 Refurbishing the old and making it new is my favorite thing to do! 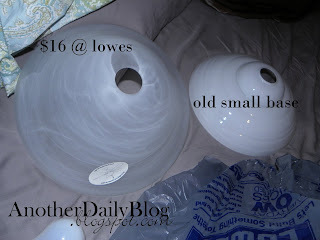 (We all know this cheapy cheaperson loves to save a buck or two, or 80)! 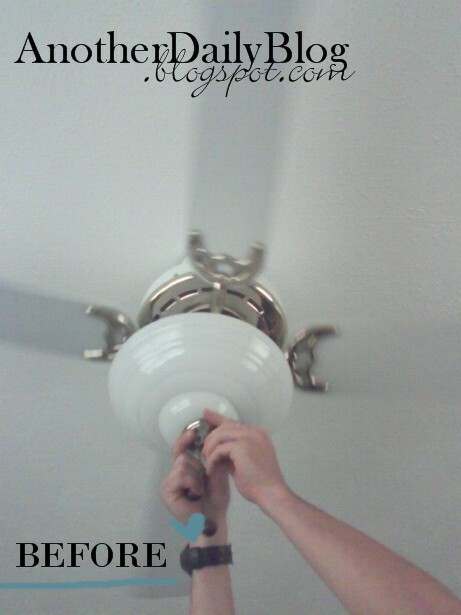 New ceiling fans (the nice ones) run from 80 on up at Lowes. uh-uh not my kinda budget! So check out what an under $4 can of oil rubbed bronze Krylon spray paint, and a $16 replacement light cover can do for this beast! Before: Ignore the quality it was a cell pic. I asked Doug to take it down for me so I could clean and spray paint it. He was in a hurry to get back to his xbox, so I had no choice but to whip out the trusty cell phone. She's white, she's brassy..
Now, this is important, I bought the replacement glass piece at lowes, GET BIGGER, bigger will enhance the look of the ceiling fan! This was only $16 at Lowes. See the difference side by side? Alright, so about 15 minutes later, the Krylon is super dry and you can reassemble the whole thing. AMAZING, right? You can totally REVAMP an ugly old ceiling fan in less than 40 minutes! One can of Krylon goes the distance! Happy Mother's Day to all you lovely woman! Both first time mothers, long time mothers, adoptive mothers, step mothers, and woman who treat other's children like your own. God bless you all :) !! My mom is a lot like me, she's very reserved, semi anti social, but very polite and expressive when need be. My mom was a selfless mother. She often went with out just so we could have things. We weren't a rich family, we lived on a single income military household. My mom stayed at home and raised us. She always made sure we were read to every night, she took time to play with us even on days she probably didn't want to. She proudly displayed our ugly art work, let us have free roam outside to discover and enjoy a childhood with out much restriction. We could get dirty to our hearts content with out getting fussed at. Mom didn't get mad when we brought in random bugs or critters we found outside. She didn't hollar at us when we dragged the whole playroom into the living room before she woke up. She loved us. She was very shy and kept to herself, but she would be quick to turn on the you know what switch if someone messed with her babies. Mom is a full blooded German, who didn't speak a lick of english when she met my military father. She came to the United States upon marrying him and learned a whole new language on her own. She is possibly one of the smartest women I have ever met. I am not just saying this, she has so much common sense it's insane. (Too bad it didnt always rub off on me) hehe. I remember a time when my dad was in Korea and we stayed here. We were very broke, we went to grocery store and my mom got minimal groceries and picked me up an issue of a magazine I loved to read, "Teen". I was 14 at the time I believe. 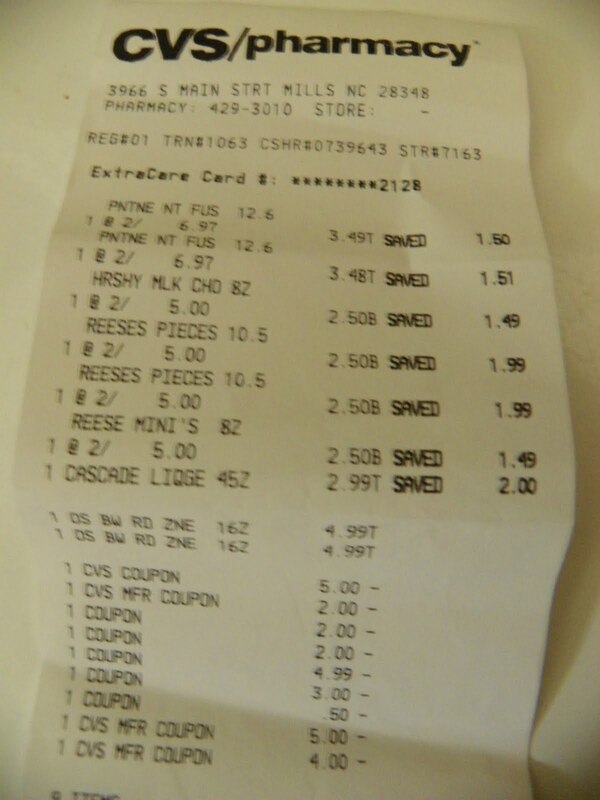 Anyway, when the register was done ringing up my mom was short on money and started to put food back. Rather than put my magazine back she put other things back. She told me it was important to read and she would do with out some other things. I remember it made me sad to see her semi humiliated but also happy to know she cared so much about me. I remember my mom not having many friends and always saving her money. I remember during prom she would pull money out of her stash and buy each of us a dress. There are so many reasons I love my mom, but the most important thing to me is that she was always there. She truly did devote her entire young adulthood to being a mom, she didnt go out and party or run the roads, she was a mom who was die hard and was going to be there for you no matter what. I can't say this has remained true throughout my adulthood, but I can say she does the best she can. I love her to pieces and I am blessed to have had her as my mother. Happy Mothers Day, Mom!! I am blessed, and I hope I can be half as amazing a mother as my own was to me! !